This week was pretty good. I finally decided clean up my plugin list. I removed a few plugins I wasn’t using anymore and went to search a plugin to replace an plugin I was using that send comment reply notifications, it hadn’t been updated in over 2 years and I always heard that’s a security risk. I noticed a few other bloggers had a option to get reply notifications, I asked Michelle which plugin she was using and she recommended “Subscribe to Comments Reloaded”, so I installed that one and deleted the old plugin. So if you were wondering why the comment area looks different that’s why. I hope you all enjoy the new plugin, now you can actually choose if you want to receive an e-mail notifications or not. I think it’s pretty neat and thanks to Michelle for recommending it to me :)! On Friday my boyfriend and I went to Leyden to buy christmas presents and ofcourse we stopped by our favourite lunch place the Jacketz to have lunch. I choose my usual jacket with beetroot salda, garlic sauce and dukah. My boyfriend had a jacket with hachee meat, cheese and peper sauce (although we thought they gave him the garlic sauce as well with some peper on top). After lunch we stopped by some stores and bought presents for my sister, my boyfriend his parents and I even found a nice present for my boyfriend as well. It was a fun day although we were both tired when we got home and spend the rest of the evening wtaching Star Trek Voyager. And another neat thing happened this week. Last Sunday I was working on sending an e-mail out with the media kits for one of my tours when I noticed the giveaway winners form theme looked weird. After looking around a bit on google drive I realized they had changed some things and you could now customize how your forms looked like. And with customize I mean you could upload your own pictures and use your own colours. 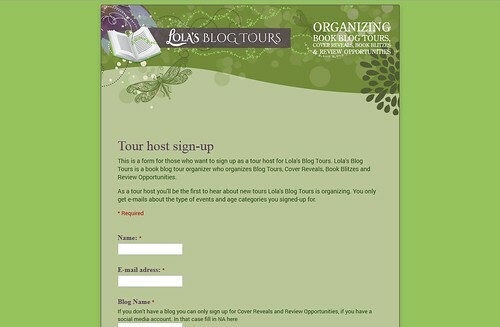 I think I played around with the theme for an hour or so, but now it just looks great, the form uses the Lola’s Blog Tours logo and the exact same colours. And it’s just so pretty I kept looking at it and talking about it to my boyfriend. I am so happy google made this change as now the form looks like it’s from Lola’s Blog Tours instead of google. I love it! Below’s a screenshot of the tour host sign-up form. As the background has the same colour as the banner you dont even see where the banner ends and the background begins. I didn’t try many new recipes this week, I mostly cooked things I already made a few times earlier. I only made a new variation of Risotto, which I called Traffic Light Risotto as it contains green beans, carrots and paprika. 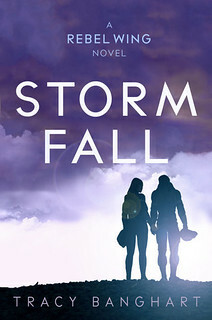 And I found out Storm Fall by Tracy Banghart was on netgalley, so ocourse I hopped over there and ended up requesting Storm Fall and another book. Imagine my surprise when I get accepted for both books and both publishers added me to their auto-approval list! And ofcourse something bad had to happen this week as well. Our dishwasher broke. On wednesday evening it took way too long to finish cleaning the dishes and when I went there to take a look all the lights went out. I got the electricity on again with help of my mom’s husband (I called him for help when the light got out). The dishwasher kept short circuiting when I put the cable in. So the next day I called the store and eventually got a phone call they will be visiting to check the dishwasher next thursday. Let’s hope they can repair it and it falls within our waranty. Now I am doing the dishes every evening I am realizing how handy that dishwasher is. I haven’t visited as many sci-fi posts this week as I hoped to. I hope I can do some blog commenting and visiting this weekend to make up for it. I did quite well for Blog Ahead this week. After Michelle had repeatedly mentioned I should do a cooking related feature I suddenly got a bout of inspiration. I already have 3 posts scheduled and made pictures for two of them. I also wrote two more Lola’s Ramblings post for January, which means I have Lola’s Ramblings posts scheduled for every week in January. I hope to get another cooking fetaure post written next week to make sure I have posst for the whole month scheduled for both fetaures! Recommended: start with Season One. What’s your life worth on the open market? A debt collector can tell you precisely. Wraith is alive… but she quickly finds out there’s a price to be paid for living. Penance is approximately 12,000 words or 48 pages, and is the sixth of nine episodes in the second season of The Debt Collector serial. This dark and gritty future-noir is about a world where your life-worth is tabulated on the open market and going into debt risks a lot more than your credit rating. It is recommended that you start with the first season, but each season is a complete story for that debt collector and can serve as an entry point to the series. 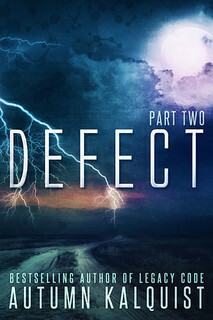 There are five planned seasons in the Debt Collector series, the first four each from the perspective of a different debt collector with the fifth season bringing all four together. Then Aris discovers that Safara’s leaders have set their sights on her, Atalanta’s hero. And she must find them before they find her . 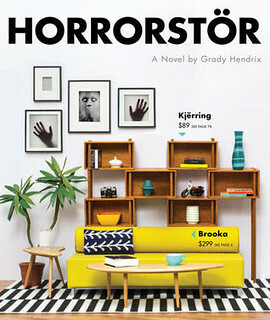 . .
A traditional haunted house story in a thoroughly contemporary setting, Horrorstör comes packaged in the form of a glossy mail order catalog, complete with product illustrations, a home delivery order form, and a map of Orsk’s labyrinthine showroom. Limited Edition: White leather bound, signed by Kelley Armstrong, numbered, full-color endsheets, and two additional full-color illustrations by Xaviere Dumaire not in the Trade. The team-spirit sign by the side of the highway seems a good omen to loner Morgan Walsh, as he drives to what could be the most important visit of his life — a chance to join the North American Pack. Then he wakes naked in the woods, surrounded by wolf tracks and a ring of suspicious cops. The situation only gets worse when he’s bailed out by Alpha-elect Elena Michaels and Clayton Danvers, her terrifying enforcer and mate. Disappointed that such a promising young werewolf risked exposing them, Elena isn’t expecting anything from the pesky retrieval job except some much-needed alone time with Clay. 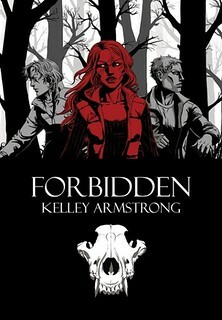 Instead, she finds a different kind of evil stalking the streets and forests of Westwood, New York. Trapped in town by a snowstorm and sabotage, Elena, Clay and Morgan must find the mysterious threat before it sets its sights on them. Have a fantastic Sunday and happy reading. I have to say I surprised myself as well! I never imagined I would be writing posts for January, but I got so excited for me new feature and started writing posts. And it’s just so nice to know I have at least two posts scheduled for almost every week in January already! I have these days were I get nothing done and then the next day I am writing two or three posts a day, it’s really weird. I can’t wait for the recipe posts. I love listening to you tell us what you eat and now I can’t wait to make them myself. I love that you are scheduled ahead, I was so excited about this and am so behind it’s awful. I really didn’t plan this very good and next week I don’t see me being able to do much posting with the holiday. You got some awesome looking books this week, I do hope you enjoy them all 🙂 Have a great week Lola! No she shoudn’t stop, she’s a good influence ;). I am thankfull for her pushing, because else I might not have taken the step to start my new feature. I already have 3 recipe posts scheduled (still need to make pictures this evening for the third post) and I have so much fun writing the posts. Although all the conversions are a bit annoying. I want to make sure that both european and US people can make my recipes because I know how much I hate converting the measurements before I start cooking. I just hate doing the dishes and I am so happy we have a dishwasher. My boyfriend has been really helpfull though and helping me with doign the dishes by hand. The Blog Ahead challenge really gave me that push to start writing and scheduling those posts, it’s a ncie feeling to be ahead. And I actually surprised myself with how many posts I managed to write. And who knows maybe next year you do better, this already was a busy month on your blog with a thankfull posts every day, I can imagine those took quite some time to write! I wnated to start Storm Fall today, but the font of the file I got was so small I could hardly read it :(. So I e-mailed the author, let’s hope she can get me an epub file! Horrostör looks really good. I have been neglecting my blog (and the internet entirely) lately, but I did some posts for Blog Ahead last night. I’m hoping to do some more today, but I might just go take a nap instead. Sorry about the dishwasher! We haven’t had one for three years and at first it was a tough adjustment but I have to say I actually prefer it now. I would be bummed to lose the storage space to a dishwasher, but its a transition for sure! Hopefully yours gets fixed. Sounds like a great day Xmas shopping, I need to do that – probably wont until next month though, which is dangerous because that’s when everyone goes. Oh well! Have a great week! She gave me just the push I needed to get started with my cooking feature. I kept thinking of excuses and saying it was too much effort. But now that I am actually doign it I love it and making pictures while cooking is fun instead of annoying like I assumed. Our dishwasher stands next to our washing machine with a shelf on top of them were I can fold the laundry. So removing it wouldn’t make up much extra space. I can imagine how a dishwasher can take up a lot of space though. I think I could get used to doing the dishes by hand, but I am used to the dishwasher now and it’s a big adjustment indeed! Yeah I am happy to have gotten the christmas shopping out of the way. I hate shopping when it’s too busy, so this week was perfect and we went on a friday which is quieter then in the weekend. Sounds like you had a fun and successful day while shopping. I’m just getting started. As for blogging ahead. I was working on that and making progress until WordPress shut me down. Now I’m self-hosting and trying to get caught up. LOL I’ll probably wait until after the holidays to try getting ahead again. That’s some great books you showcased. I have a few of them on my wish list. WordPress shutting you down sounds like such a hazzle, I’ve been hearing a few other bloggers got shut down as well. Glad you got your blog up again! I made the switch to self hosting earlier this year and I am happy I did, although you really have to get used to it at first. Ofcourse you can also try getting ahead later when this challenge isn’t running. I was lucky this was a relatively quiet month at work, so I got a lot of blogging done and then when work get’s busier I at leats have all thsoe pre-scheduled posts already. I use comment luv for reply notifications it keeps it simple. The recipe posts are a great idea, so glad you are doing good with blog ahead! Have a terrific week Lola! 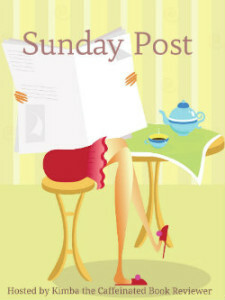 kimbacaffeinate recently posted…Sunday Post #135 Gobble? I am using commentluv, but couldn’t find a setting for reply notifications, weird! I’ll have to check it out again. I am really exciting for my cooking/ recipe feature to start! I alreayd have a post scheduled for each week in January and it suddenly seems so far away as I want to share the posts now! Sounds like you’ve had a busy week! Sorry about your dishwasher, but congrats on getting a head start on Christmas shopping! Enjoy your new books, and thanks for stopping by my SP & STS. It was abusy, but nice week :). I hope the dishwasher can be fixed, it’s weird to do the dishes now. I am happy we got most of the christmas shopping done, makes me feel ahead :). The google forms is awesome. I played around with that for an author sign up for an event. I love you can customize it now. Your form looks so nice! I am really happy with the progress I made and never thought I could get this many posts scheduled in advance, I hope to add a nother few posts this week. I just love that they finally added the option to customize it, now not everyone’s form looks the same anymore! your google form looks AH-MAZING!! and wow congratulations for having a post scheduled every week in Jan! that’s thinking really far ahead… i barely have my next post written yet heheh =P looking forward to FOOD POSTS, all the best! Thanks Alicia, I am really hapy with how the form turned out! And I only have two posts for every week scheduled in January, so it sounds better then it is, but it’s still a nice start! I like scheduling some posts ahead, but I never scheduled posts this far in advance, the Blog Ahead challenge really helped with that. Looking forward to your dystopia post. My boyfriend had school friday mornign, so we thought it was a ncie opportunity to meet up afterwards and get most of the shopping out of the way. It feels nice to have that doen already! There’s a blogger who participates that has posts scheudled for May, now that’s an accomplishment. Although I am pretty happy with my posts for January scheduled :). I had to make time for scheduling all this posts this month, but the good thing is that it frees up time in the next months. I wish I read books fast enough to have books scheduled that far ahead. 🙁 Enjoy your new reads and have a great week! Me too, which is why I don’t have any review posts scheduled for the upcoming months yet. 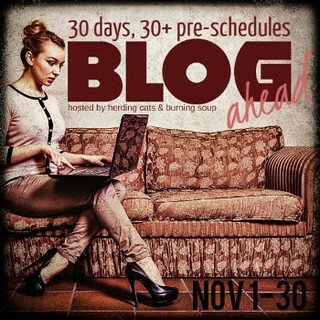 I mostly have written blog tour posts, discussion posts and posts for my new cooking feature. Sounds like you’ve had a productive blog week between cleaning up your plugins, reorganizing things and Blog Ahead! Great job on your Christmas shopping as well! I’m so not ready. It looks like you got some fun books this week and I love getting those auto-approval emails! Have a great week! Yeah it certainly was a productive week :). As long as you get your chrstmas shopping done in time for christmas it’s okay, although I like to do mine early. Sounds like a fun and busy week. I don’t use a dishwasher, it’s just the two of us so doing the washing up only takes minutes and I don’t mind doing it. I actually find it relaxing. Love the new form, it looks very professional now it has your own theme on it. You’ve gotten some interesting looking books, hope you enjoy them all. Now I don’t have a dishwasher I am actualy surprised how quickly we get used to washing the dishes without it. I am really with the new form, it’s so awesome to be able to customize it. They also have a great variety of premade themes, much more choice then with the old version. It’s a bit frustrating to know all those posts scheduled are for so far ahead as I want to be able to share them now, lol.